Nicola Pfeffer was born in Tübingen. 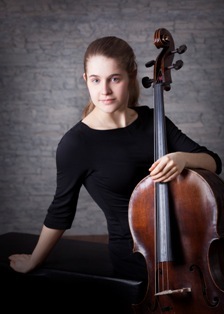 She began her cello studies at the age of seven with Joseph Hasten in Tübingen and continued with Prof. Conradin Brotbek at the University of Music Stuttgart first as a young student and since the winter semester 2015/16 as a regular student. She participated in numerous master classes with renowned cellists, including Jan Vogler, Prof. Peter Buck, Prof. Claudio Bohorquez, Prof. Ulf Tischbirek und Prof. Jan Ickert. For many years she took part in the annual national competition Jugend musiziert. She was awarded lots of prizes, including six times the 1st Prize in the solo category as well as in chamber music category. In addition she received the Special Prize for the best family ensemble 2013, a promotion prize called Sparkassenförderpreis in 2013, 2014 and 2015, the Prize of the Bundesapothekerkammer 2014 and twice the prize for the best cello ensemble donated from Celloakademie Ruteshei, a scholarship from the foundation Deutsche Stiftung Musikleben. Recently, in may 2016, she won the 1st Prize and the Special Prize of the Servais Society in the International Competition Prix Edmond Baert in Brussels. Moreover she is a member of the “Live Music Now” Yehudi Menuhin Society since 2016. You can listen to Nicola here. If you are interested in working with Nicola, please get in touch with the EMCY Office.